"An upscale thrift store which offers everything the larger stores do"
Hand To Hand Thrift Store is an upscale thrift store which offers everything the larger stores do, only in a smaller, homey fashion. 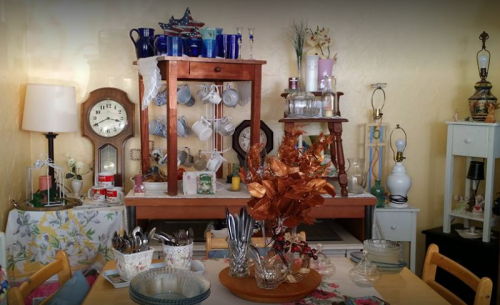 They sell household decor, books, DVDs, children’s games and toys, clothing, women’s accessories, furniture, kitchen and dining items, linens and so much more. Being a Christian based non-profit everything you buy helps support their Ministry, Hand To Hand Direct Care Ministry, Inc. Hours of operation are: Wednesday and Friday 10-5; Thursday 10-6; Saturday 10-4. They offer a Senior Citizen 25% discount on Wednesdays and have a Dollar Clothing Rack everyday of the week. Tel: 860-888-4057. Hand To Hand Direct Care Ministry, Inc. is a community Ministry whose mission is to help those in need with basic necessities for daily life. Donations are accepted and bulk pick-up is available. Contact them at 860-845-3771 or handtohanddcm@gmail.com.